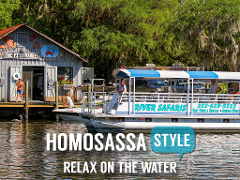 Let River Safaris take you to the famous ‘Blue Waters’ that are the headsprings of the Homosassa River. In just over an hour, you will learn about the springs hydrology and also the residents that make this eco-system so precious! 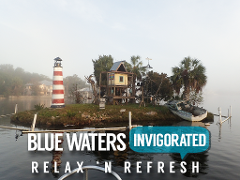 Swim with River Safaris and get refreshed in the cool “Blue Waters” of Homosassa Spring. This fresh water snorkel lasts nearly 2 hours and we provide you with everything you need for an awesome time! With an area so rich and history why wouldn’t you want to see it all? 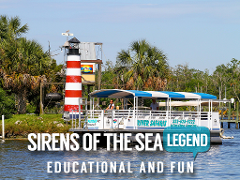 This relaxing guided pontoon tour takes you to both the Blue Waters of Homosassa Spring and then to the Gulf of Mexico. Don’t miss the boat! 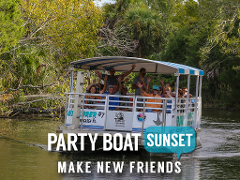 Sit back and relax as our skilled Captains navigate a covered pontoon through the scenic Homosassa River. 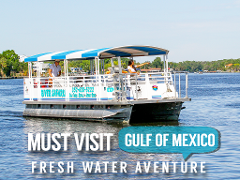 Take in the sights and sounds of the River and pass through the notorious ‘Hell’s Gate’ to an open view of the Gulf of Mexico. No one has a tour like this! Not sure if you want to spend the evening boating or bar hoppin? We have a safe and fun solution for you! 2 hours on our comfortable pontoon stopping at a variety of waterfront locales!